I have done graphic and web design at Educomp. The following is a summary of the sites I have created or worked on, and a rundown of the work I’ve done in creating them. 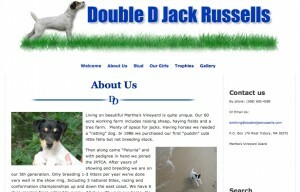 A site for Double D Jack Russell Terriers, a dog breeder on Martha’s Vineyard. The logo was created in Photoshop using a photo of one of DD’s dogs and some original design work. The DD horizontal rule was created from scratch. The layout of the page was done with a combination of Dreamweaver and WordPress, using the “SubtleFlux” WordPress theme as a template and modification of existing PHP and CSS in Dreamweaver, with testing live on the server. This site was designed for the Committee to bring beer and wine to Tisbury, Martha’s Vineyard, Massachusetts. It was created with Dreamweaver and Photoshop. This was my first design for Educomp, done in basic HTML. It is laid out with Tables (I have since moved to div based layouts) and CSS stylesheets. The banner image was created in Photoshop – the design is mine, using an existing public domain image of a grapevine that was modified to fit the theme and layout of the page. The design initially used empty placeholder images where the photos were intended to be, the photos were chosen later by the Committee. The “Vote Yes icon” was superimposed from a pamphlet that had been previously designed for the campaign. The design features consistent themes throughout the pages, rollover highlights, anchored links, PDF downloads and links to external sites. It is not certain whether it affected the vote in the town meeting, but the choice to have beer and wine on the ballot passed said meeting, and the site will presumably be updated for the 2010 vote. The number of site visitors exceeded the total number of yes votes at the meeting.